Ferruccio Lamborghini. Photos courtesy Lamborghini. On April 28, 1916, Ferruccio Lamborghini was born into a grape farming family in Renazzo di Cento, in Italy’s Emilia Romagna Region. From these humble beginnings, and following the hardships of World War II, he would rise to start a series of successful manufacturing companies, including Lamborghini Automobili, the Italian supercar manufacturer begun as a slap in the face to Enzo Ferrari. On the 100th anniversary of his birth, we lift a glass of (virtual) Chianti to the life of Ferruccio Lamborghini. Though blessed with broad shoulders, a large build and a powerful handshake, Lamborghini also possessed a keen mechanical aptitude. This gained him entrance into the Fratelli Taddia technical institute, but the Second World War intervened before Lamborghini could complete his coursework. Drafted into the Italian Air Force in 1940, he would spend the bulk of the war stationed on the Greek island of Rhodes, serving as a mechanic and working in logistics. In 1945, Lamborghini was captured by the British and briefly held as a prisoner before being repatriated to Italy in 1946. Lamborghini’s first business venture was an auto repair garage, opened in Pieve di Cento in late 1946 or early 1947. Using what little spare time and money he had, Lamborghini turned a secondhand Fiat Topolino into a competition car, entering it into the 1948 Mille Miglia. A late-race crash destroyed the Fiat and convinced Lamborghini that his path to fame and fortune would not come as a racing driver. Lamborghini’s factory in Sant’Agata Bolognese in June 2009. Photo by Umberto Guizzardi. Instead, Lamborghini looked to his agricultural past with an entrepreneurial eye. With military surplus hardware both plentiful and cheap, Lamborghini found ways to repurpose this for sale to the region’s farmers. His equipment soon gained a reputation for durability, and in 1949, Lamborghini Tractori SpA, a tractor manufacturing business, was born. To distinguish his tractors from those of the competition, Ferruccio adopted a black-and-white livery and used a logo that incorporated a fighting bull, a nod to both the equipment’s rugged construction and to his own zodiac sign. As David Joliffe and Tony Ward point out in Lamborghini: Forty Years, Lamborghini understood the importance of marketing. To demonstrate the advantages of his namesake tractors, Ferruccio would often stage tug-of-war competitions with competing brands in towns and villages near his plant, and sales grew with the brand’s reputation. Now a comparatively wealthy man, Lamborghini left his Fiat days behind, instead favoring automobiles from Alfa Romeo, Jaguar, Mercedes-Benz and, eventually, Ferrari. Ferruccio Lamborghini purchased his first Ferrari, a 250GT, in 1958, and would buy several more in the coming years. While he admired their style and performance, he found their durability and comfort lacking, viewing them as racing cars only mildly repurposed for road use. Worse, perhaps, was the brand’s post-sale support, and after several trips to Maranello for repairs or mechanical adjustments, Lamborghini had had enough. A call was placed to Enzo Ferrari himself, during which Ferruccio Lamborghini intended to request a face-to-face meeting. Except that Enzo Ferrari would neither take nor return Lamborghini’s call, relegating the task to one of his management staff. To Lamborghini, who viewed Enzo Ferrari as an equal (since both were prominent businessmen in the region), this was the ultimate insult, prompting a vow to beat Ferrari at his own game. With the fiery determination of a man scorned, Lamborghini set out to start a new company, one that would craft the finest grand touring cars in the world. 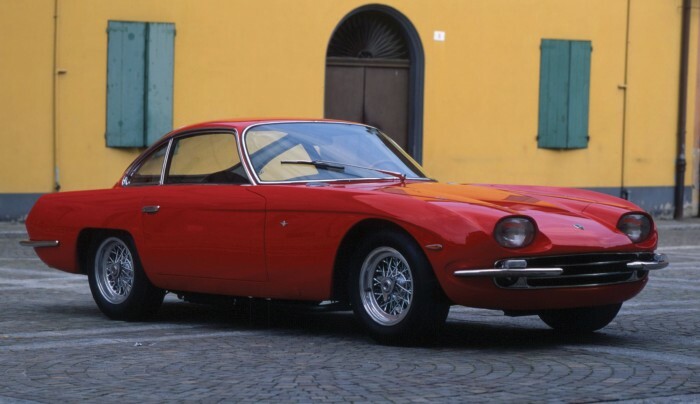 Lamborghini’s first production car, the 350 GT. His timing could not have been better. After finding an available tract of land in nearby Sant’Agata Bolognese, Lamborghini cut a now-unbelievable deal with the local government, desperate to reduce unemployment in the region. In exchange for allowing factory workers to join the powerful sheetmetal workers union (which essentially guaranteed there would be no layoffs at the plant), Lamborghini was granted a tax exemption on corporate profits for the first 10 years. Better yet, he was granted interest-free loans to build the plant, and set up with an account that paid a guaranteed 19-percent interest on profits from his new business venture. With this part of his plan locked up, construction on the factory began in 1962. Lamborghini needed engineering talent to realize his goal, and among his first recruits was Giotto Bizzarrini, a man who’d spent five years working as Ferrari’s chief engineer, before walking away from the company in 1961. Thanks to a plentiful pool of local talent, Lamborghini and Bizzarrini had no trouble in staffing the bold startup with experienced designers and mechanical engineers, and Bizzarrini’s first task was to design a Ferrari-beating V-12 from a clean sheet of paper. While Lamborghini wanted the new engine to use a short stroke and dual overhead camshafts on each head, he left the rest of the design up to Bizzarrini. Legend has it that Bizzarrini, working as a contractor for Lamborghini Automobili, refused outright payment for the design of his engine, opting instead to charge a fee for each horsepower his new engine produced above and beyond Ferrari’s road-going 3.0-liter V-12, which then produced 250 hp. Giotto Bizzarrini (L), Ferruccio Lamborghini (C) and Gian Paolo Dallara. In early testing, Bizzarrini’s 3.5-liter V-12 was said to produce an impressive 360 horsepower, but this was dialed back to 280 horsepower (still 30 more than Ferrari) by the time the engine was dropped into a car. The automaker’s first effort, the Lamborghini 350 GTV, was styled by Franco Scaglione and shown to the public at the 1963 Turin Motor Show. Despite a warm reception from the press and public alike, Lamborghini was said to be unhappy with the build quality of the car (which, in fairness, had been completed in just 120 days), so the 350 GTV was proclaimed a concept at the end of the show and parked in the company’s warehouse. For its next effort, the 350 GT, Lamborghini would turn to Touring of Milan to produce its body. Debuting at the 1964 Geneva Motor Show, the car would enter production the same year, and by January of 1965, Lamborghini had delivered 13 examples into the hands of paying customers. In just two years, Ferruccio Lamborghini had taken his dream of producing GT cars to challenge Ferrari and turned it into a reality, but the best was yet to come. 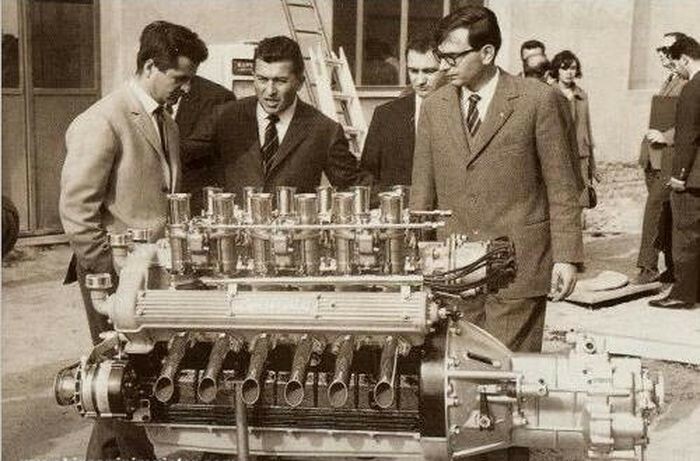 In 1965, Gian Paolo Dallara, Lamborghini’s chief designer, penned a chassis with Paolo Stanzani and Bob Wallace for a project that Lamborghini referred to as the P400. Wearing a body styled by Marcello Gandini, the P400 debuted to rave reviews at the 1966 Geneva Motor Show, and those in attendance were blown away by the car’s futuristic styling and mid-engine design (though the engine cover was kept closed to hide the fact that ballast occupied the space where the engine would be). Production examples would come powered by a variant of Bizzarrini’s V-12, now displacing 3.9 liters and producing 350 horsepower, and the car that would become best known as the Miura solidified Lamborghini’s reputation as an automaker capable of producing the highest performance road cars in the world. The early 1970s weren’t kind to Lamborghini, who sold off his tractor company in 1972 along with 51 percent of his holdings in Lamborghini Automobili. The oil crisis of 1973 worsened sales, and in 1974, Ferruccio Lamborghini sold off his remaining 49 percent share in the company. Opting to retire at age 58, Lamborghini moved to his 740 acre estate in central Italy, where he spent his days hunting, making wine and running the businesses he was still involved with. Somewhat remarkably, he even fathered a daughter with his third wife, but largely remained out of the public eye. 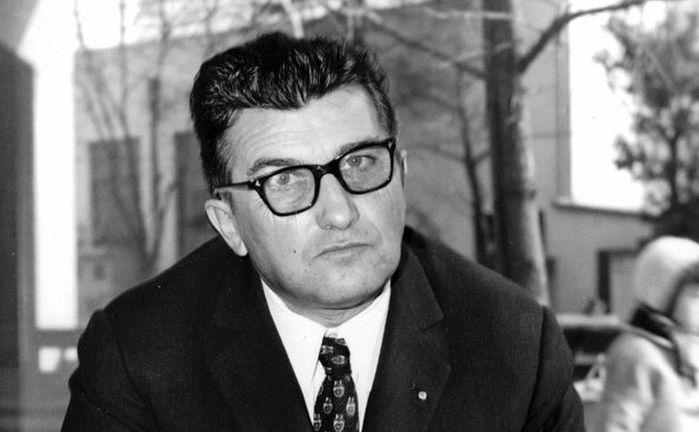 On February 20, 1993, Ferruccio Lamborghini died of a heart attack at age 76.